Alvin, Simon and Theodore hit the road on a quest to the Big Apple in the first poster for Alvin and The Chipmunks: The Road Chip, arriving in theaters December 23. The sequel is still in production, so it isn't known when we may get the first trailer. 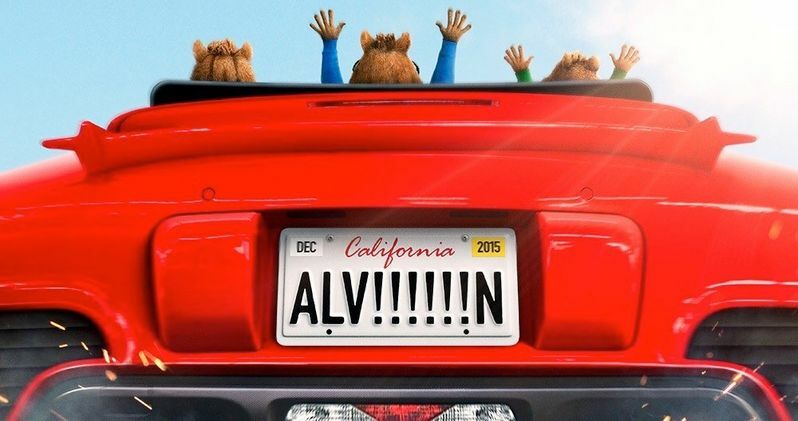 Unfortunately, the one-sheet doesn't give us a good look at the chipmunks quite yet either, but it does set up the road trip theme. Through a series of misunderstandings, Alvin, Simon and Theodore come to believe that Dave is going to propose to his new girlfriend in New York City...and dump them. They have three days to get to him and stop the proposal, saving themselves not only from losing Dave but possibly from gaining a terrible stepbrother. Jason Lee returns to voice Dave Seville, with Jason Lee, Matthew Gray Gubler and Jesse McCartney voicing the chipmunks. Tony Hale is portraying the main villain, with Bella Thorne also starring as a character named Ashley, but no further details were given regarding her role. Walt Becker (National Lampoon's Van Wilder) directs Alvin and The Chipmunks: The Road Chip from a script by Randi Mayem Singer (Mrs. Doubtfire). We'll keep you posted as soon as the ||first trailer debuts, but, for now, take a look at the one-sheet. Are you looking forward to these three chimpunk brothers hitting the road together on the big screen?